Germany continues with restructuring efforts to ensure a sustainable PV market. 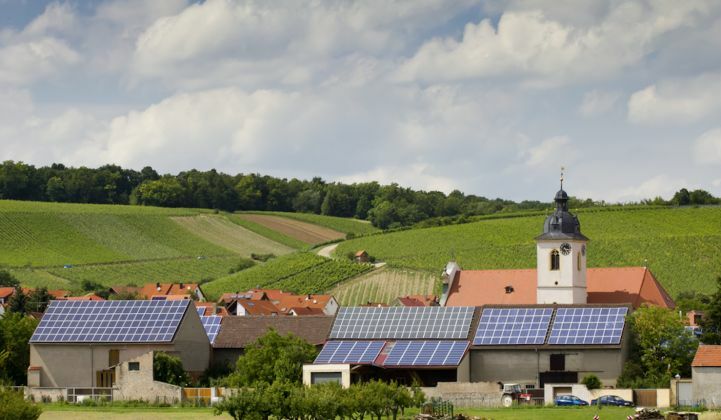 Germany is learning to manage its solar growth, with some growing pains. Over the years, the German government has sharply reduced residential feed-in tariffs (FITs), which initially spurred rooftop solar installations at a pace beyond what German power grids and energy markets can accommodate. Cost has become a problem as well. The FIT is subsidized by a bill surcharge on residential utility customers, which has become less palatable to German consumers. How might these trends shape the future of solar power in the country? “In the past, the main driver of Germany’s significant residential solar growth was that it was an economically feasible way that everyone could invest in renewable energy. Small utilities aggressively promoted it. Now, the economics behind solar investments have become more difficult,” said Marcel Muenz, energy industry advisor with PA Consulting Group. “For Germany’s energy market, this shift is good overall. It brings costs down -- even, over time, for residential customers. Germany had to move away from high subsidies,” said Muenz. “Of course, there will be winners and losers." The FIT remains in place for residential solar in Germany. Utilities will continue to pay households with existing solar installations their agreed-upon rate, which can be as high as €0.52 per kilowatt-hour. However, the FIT for new residential rooftop solar is only about €0.13 per kilowatt-hour -- substantially less appealing to German consumers. Germany’s FIT continues to be funded through a reallocation charge, which appears on every residential utility bill, whether a household has solar installed or not. The federal decision to reduce the FIT was partly in response to public pressure, rooted in the view that non-solar customers were effectively subsidizing solar customers and other renewable generation such as wind farms. “Many people campaigned against the FIT because they saw the reallocation charge on their monthly electricity bill,” said Muenz. According to Muenz, German consumers have paid far more over the years to subsidize nuclear power, which is being rapidly phased out, and will continue paying for nuclear waste treatment for decades. “But the nuclear subsidy never showed up as a line item on their monthly bill,” he noted. This FIT reduction has significantly slowed the growth of residential solar in Germany. Between 2009 and 2013, Germany had added about 7 gigawatts of solar per year. In 2016, that sector will likely grow only 1,200 megawatts to 1,400 megawatts. “Residential solar is no longer economically feasible 100 percent of the time, like it used to be,” Muenz observed. Germany’s energy transition initiative (Energiewende) still includes aggressive targets for adding solar, about 2.5 gigawatts per year. More than half of that growth is coming from utility-scale solar projects. As of January 1, 2017, all German renewable projects larger than 750 kilowatts will be funded through auction mechanisms, which have been tested over the last few years. The subsidies will still be funded by consumers, but the tenders are designed to drop overall costs through increased competition. This auction system appears to be functioning well, and it’s consolidating the formerly fragmented German renewable energy market. Larger utilities are beginning to dominate the new growth in project development. As such, the auction system works better for bigger utilities. Some large utilities are taking the opportunity to diversify, especially into battery storage. For instance, the German utility RWE, which serves 23 million customers throughout Europe, recently announced an expansion of its grid-scale solar and storage capacity, by purchasing Belectric Solar and Battery Holding GmbH. Similarly, the major German utility E.ON is investing in a U.S. energy storage company, and is developing large-scale storage projects in Germany and elsewhere. But so far, behind-the-meter storage projects are lagging in Germany, despite market potential. Germany expects to invest €18 billion over the next five to eight years to update and expand grid infrastructure, both for transmission lines and distribution grids, as well as for smart metering and technologies to support advanced strategies such as virtual power plants. This will be funded through grid fees, which all German utility customers (commercial and industrial included) pay for on their utility bill. This fee will increase, but it’s unlikely to be controversial. Meanwhile, Germany is continuing to invest in wind infrastructure; however, in the north, where wind resources are most abundant, transmission line access is insufficient. Recently, the Guardian reported that the German government has had to cut its original target for wind energy expansion by half in the north. The power grid cannot be expanded quickly enough to supply this energy to the south, which has the greatest demand. This has led to more curtailment, a situation where the state pays wind power producers to switch off their turbines to avoid excess production. Last year, northern Germany produced 4,100 gigawatt-hours of wind power that could not be consumed domestically.